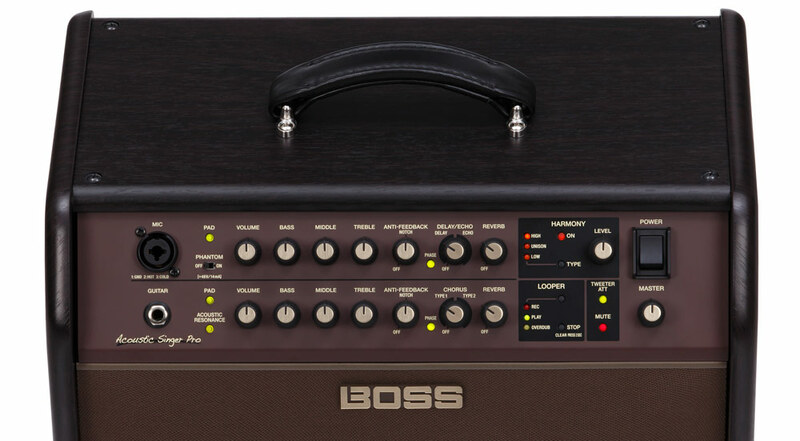 BOSS Acoustic Singer Pro guitar amp with Taylor 510e acoustic guitar. 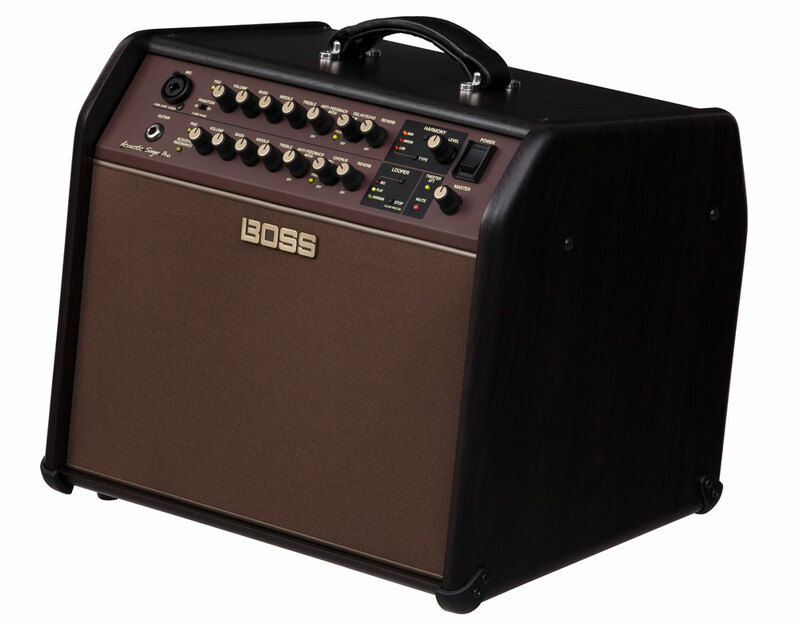 The BOSS engineers that developed the Acoustic Singer amps are extremely passionate about acoustic guitar sound. They pushed the limits to improve on past designs, developing fresh approaches to accurately capture the instrument’s three-dimensional tone and fast transient response. Newly designed bi-amped power sections with extended peak power provide full dynamic range and lots of punch. The woofer’s special cone material eliminates low-frequency distortion that can muddy the sound, resulting in tight performance that fully reproduces the acoustic’s natural feel. These characteristics are further supported with a unique cabinet construction method that eliminates unwanted resonances. The Acoustic Singer amps deliver enhanced projection with a tilt-back cabinet and other design elements. The acoustic guitar produces a rich, diffused sound field, and great care was taken to reproduce this experience when playing through the amp. To this end, the woofer’s unique cone shape offers enhanced projection, while the special dome tweeter provides wide high-frequency dispersion. In fact, even the grill cloth material was carefully chosen to minimize the restriction of high frequencies. For applications where a softer sound is desired, you have the ability to attenuate the tweeter level from the panel. The Acoustic Singer Pro is equipped with an 8-inch speaker, dome tweeter, and 120 watts of power. The Acoustic Singer Live is slightly more compact, and comes with a 6.5-inch speaker, dome tweeter, and 60 watts of power. Beyond these differences, the amplifiers offer identical feature sets. The Acoustic Singer amps feature two independent channels. Each includes a three-band EQ and high-quality reverb, plus a phase switch and notch function for feedback control. The channel inputs also have discrete analog circuits with high headroom for rich, responsive sound. 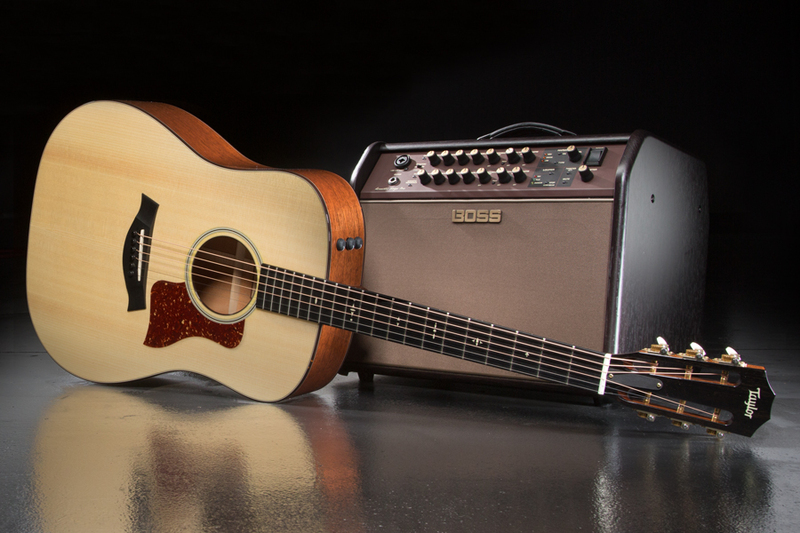 The Acoustic Singer amps feature intuitive panel controls for getting great sounds quickly. A dedicated guitar channel features an Acoustic Resonance function that restores natural acoustic tone to stage guitars with undersaddle piezo pickups. It uses advanced BOSS processing to bring back the rich, woody resonance that makes playing the acoustic so inspiring. A simple switch allows you to toggle through three different Acoustic Resonance settings, or to bypass the processing entirely. The guitar channel also features two types of chorus effects. The vocal channel has an XLR combo input with selectable phantom power, plus a great-sounding delay/echo effect. Even if you’re only using the amp with a guitar, you don’t have to let the vocal channel sit idle. For example, you can use it to mic up your acoustic, or to blend a second pickup or internal mic installed in the instrument. Acoustic Singer amps feature an onboard vocal harmony function derived from the VE-8 Acoustic Singer pedal. It provides real-time harmonies that follow the guitar input, making it easy to achieve impressive vocal sounds automatically. Each amp is also equipped with a looper for recording on-the-fly backing with vocals and guitar. This provides a great way to spice up live performances and have more fun during practice sessions. 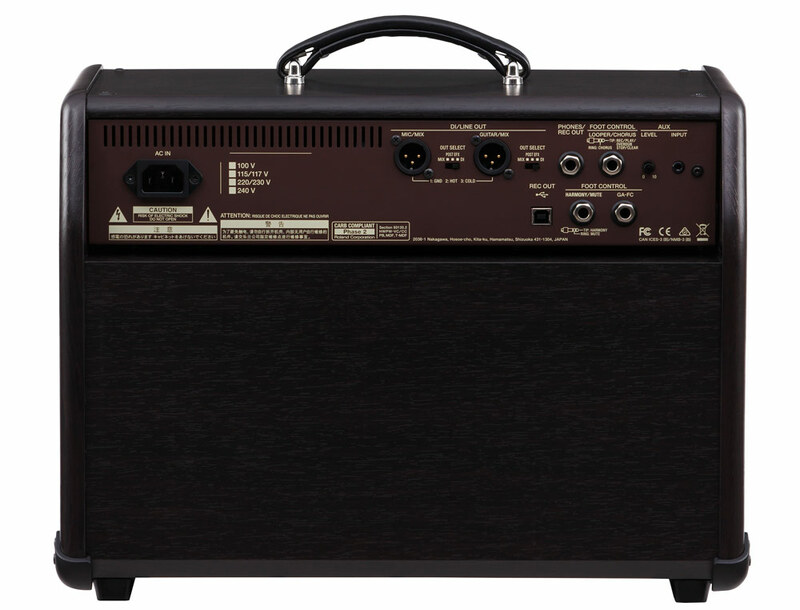 The Acoustic Singer amps feature two balanced DI outputs. Each has a mode switch for outputting both channels mixed together, or individual channels direct or post-effects. This provides great flexibility for connecting to a stage PA and other devices. Using the aux input, you can plug in your smartphone and play music for live backing or practice. There’s also a USB jack, which provides a convenient way to record tracks and song ideas directly to a computer DAW. In addition, multiple jacks are on hand for connecting optional footswitches to control looper, harmony, and effects functions while performing. The rear panel of an Acoustic Singer amp features lots of connection options. To learn more about these powerful new stage amps, visit the Acoustic Singer Pro and Acoustic Singer Live product pages.